Mick O'Dwyer pictured at the GAA Museum this morning. KERRY LEGEND MICK O’Dwyer is one of four players to be inducted into the Hall of Fame at the GAA Museum at Croke Park. O’Dwyer has been named alongside Waterford hurler Pat McGrath and Kilkenny’s Noel Skehan along with Sligo footballer Michael Kearins. The quartet are second group of former players to receive the awards since the inaugural event last year. O’Dwyer has been involved, as a player and manager, in GAA for over 60 years. He won four All-Ireland titles with The Kingdom and managed his county during a golden period in the 1970s and 80s. Under his guidance, Kerry won eight All-Irelands, including the famous four-in-a-row. He went on to coach Kildare, Laois, Wicklow and Clare. McGrath was a Déise hurling star from his 1970 debut until 1986. He captained the Waterford U-21 side to the All-Ireland final against Kilkenny, which they lost, and won Railway Cup titles in 1976 and ’78. His sons, Ken and Eoin, have played for Waterford in recent years. Kilkenny goalkeeper Skehan won an impressive nine All-Irelands, three National Hurling Leagues, eight Leinster titles and four Railway Cups. Kearins played for Sligo for 18 consecutive years and scored 1,158 points in 215 games. He won two Railway Cups and, in 1971, was the first Sligo player to be named on an All-Star football team. GAA president Liam Ó Néill commented, “It is a great honour to welcome these four outstanding GAA ambassadors into our Museum Hall of Fame and it is difficult to think of more fitting men for the award. Email “Kerry's Mick O'Dwyer among four legends inducted to GAA Hall of Fame”. 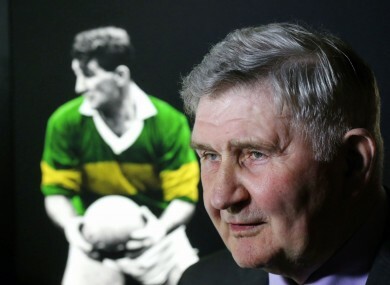 Feedback on “Kerry's Mick O'Dwyer among four legends inducted to GAA Hall of Fame”.